Got a question? Something on your mind? Send me an email. I will always do my best to answer, and once a month I’ll illustrate the answer in a post. I am a middle school art teacher. Can you help me think of an interesting way to display Easter eggs that would not be abhorrent to pastel-hating 13 year-old students? Every year my class paints eggs and they always come out beautiful, but we don’t have a good way to display them. They sit in egg cartons for a week and then the kids wrap them in tissue and stick them in their backpacks where they get crushed on the way home. There must be a better way than this! I like your tree made from branches but I fear it will be too delicate for my classroom with 110 touchy feely grabby kids coming in and out each day. 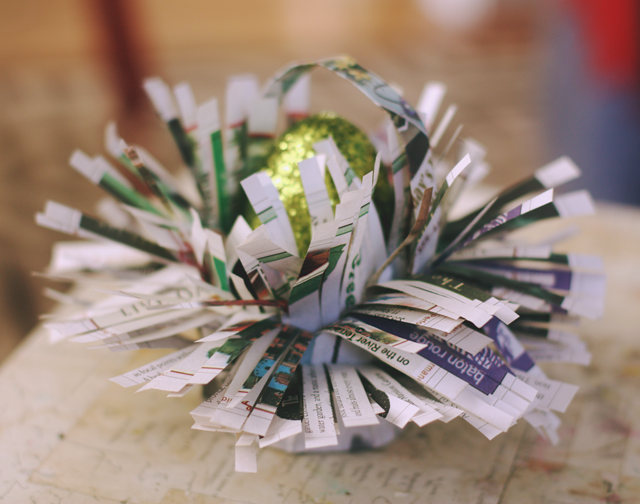 I would like something that each individual student can make to hold their egg while it is on display, and if it could help them carry it home, even better. I was thinking baskets of some sort. What do you think? Oh, and the materials need to be free. Can you think of anything? Let me get this straight: Something sturdy enough to house an egg that does not look Eastery AND would appeal to adolescents AND be made for zero money. Melisa, you don’t make this easy do you? 1. Start by trimming the cup/container down to size. Or not. Deeper the cup, the more chocolate to hide. 2. 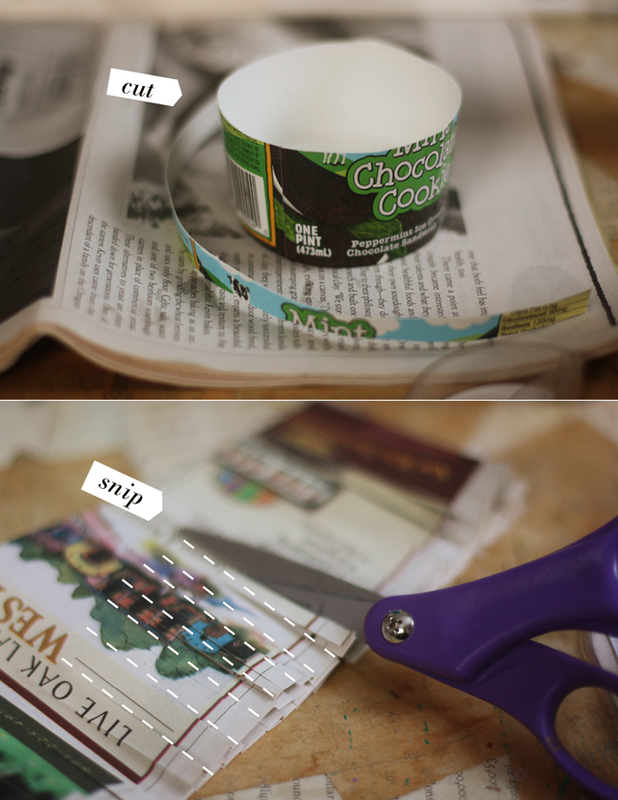 Trim 2” fringe into the newspaper, leaving a ½” border in tact.smear glue along the inside of the cup and run fringe along the inside. 3. 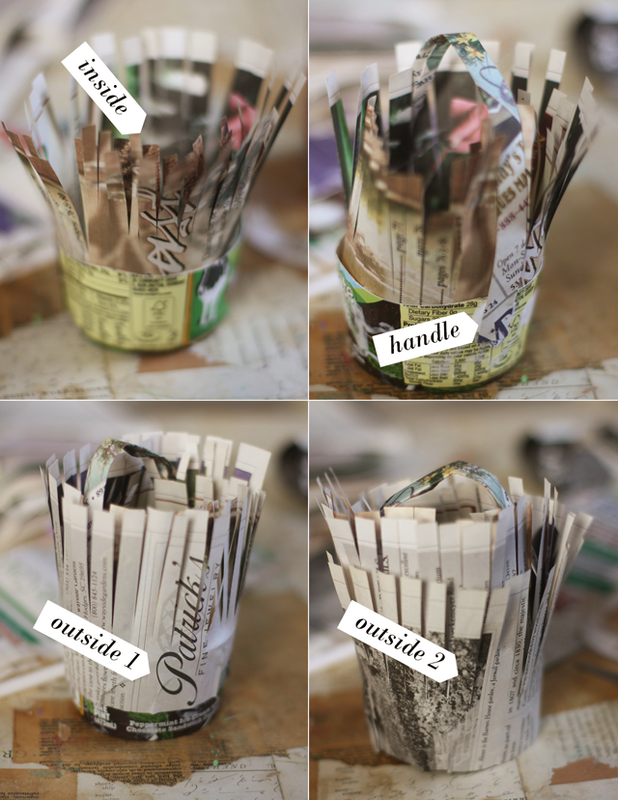 Attach a handle made of a 1” wide length of newspaper folded over 4 times, and attach to the outside of the container. 4. 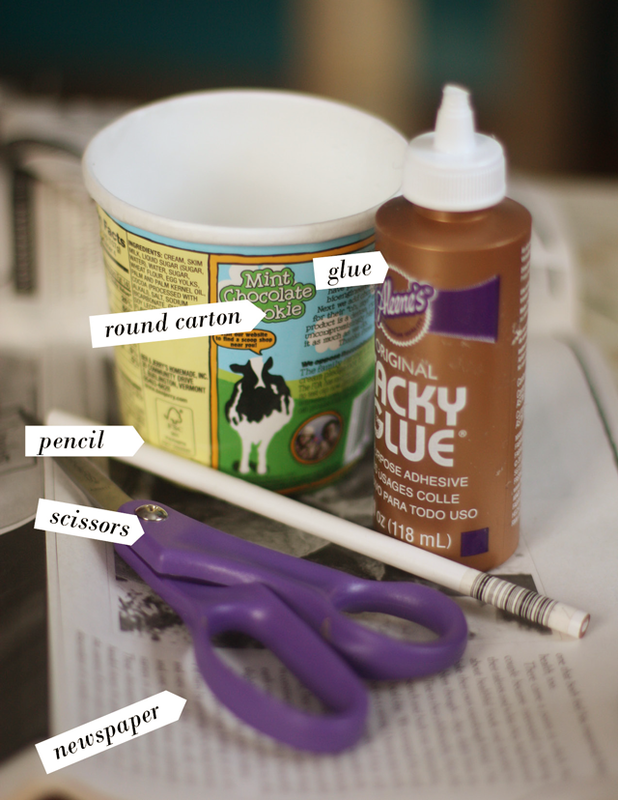 Smear the outside of the container with glue, then starting at the top, wind fringe around the outside of the container, leaving at least a ½ inch band exposed at the bottom. 5. Wind a second layer of fringe around the outside, covering the bottom edge. 6. Fold down each individual piece of fringe. Optional: Use pencil to curl paper. (I didn’t). That’s it. 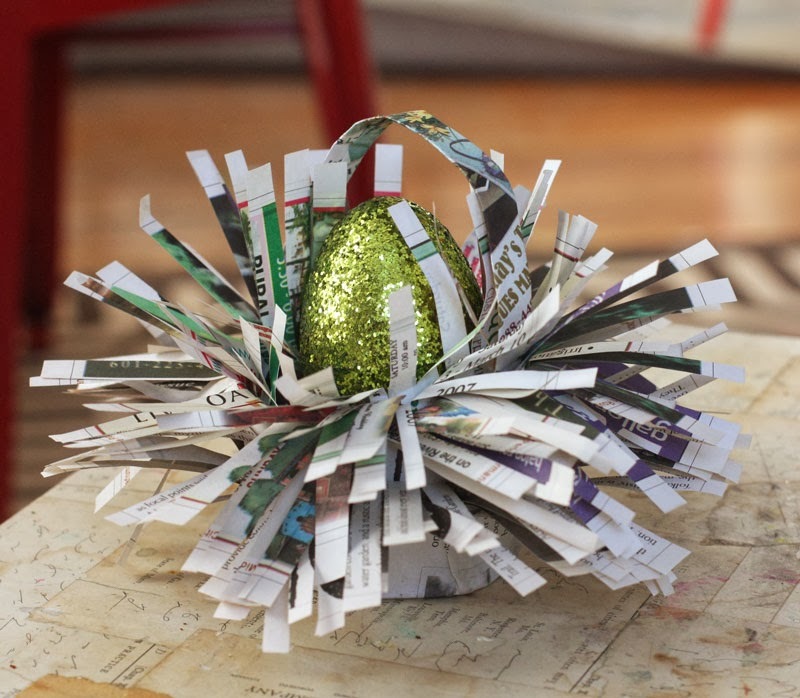 A pastel-free, cheese-free, easy-to-make Easter basket that a 13-year-old won’t be too embarrassed to seen carrying on the bus. It looks a little like a chicken. An exploding Newsie chicken. Or a hat. A big fat totally rad exploding Newsie chicken hat. Yeah. Now let’s take an artsy photo and make it fancy. I dare you to tell me that ain’t fancy. No emails or RSS feeds or fan groups for I Believe In Strangers. I wanted it to be a resource when people needed it, not a reminder to sit in inboxes. 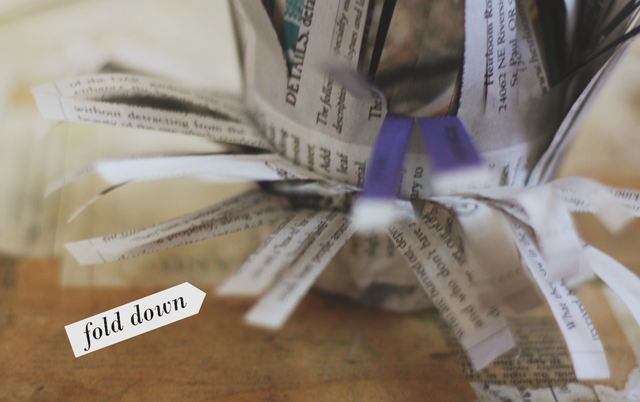 Not that it matters now…it’s on hiatus due to lack of submissions. So there is nothing to miss! 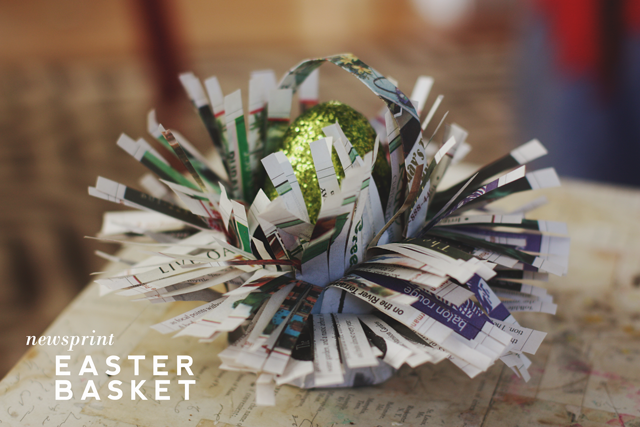 That is the most clever Easter basket I have ever seen. 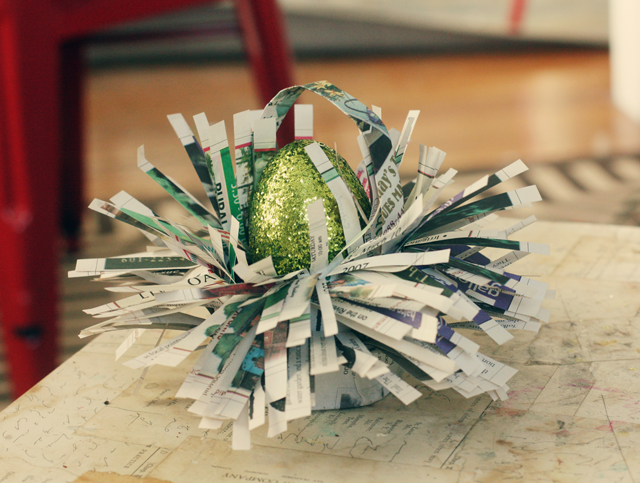 Makes me want to decorate eggs just so I can make a few of these. So funny! So perfect! Melisa and her kids got their money’s worth for sure. Thanks for another charming object of desire, Peaches! Awesome!!! This will work for 2nd graders too. Thanks!